Ever since Death put up the shaky wall in Sam's head, shielding him from the memories of Hell and all the badness that came with it, the audience of Supernatural has been counting down until the day it starts crumbling. You knew it was going to happen. It's been the elephant in the room since this whole mess started. Death tells Sam don't scratch the wall, else bad things will happen. Dean tells Sam don't scratch the wall, else bad things will happen. And what does Sam do? Pokes and scratches at it until minor cracks start emerging. One trickle of memories gives way to another trickle of memories and then he finds himself seizing on the floor at the end of “Unforgiven” because bad things will indeed happen if you scratch the wall. Who could have guessed? But Sammy has a soul now and he needs to make penance for all the bad things he's done, so if that means he's got to sacrifice his own well-being to do it, then that's what he's willing to gamble. Now, before you start rejoicing, think of the possible ramifications from this event. 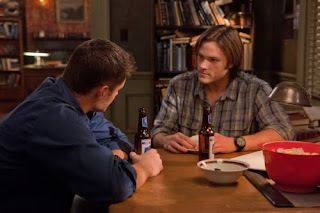 Sure, they could cop out with a quick scene of seizing torment on the part of Sam and then all is well again, but this is Kripke we're talking about. And this is 150 years of pure torture that Sam went through, not to mention the topside memories of Soulless!Sam that will come along with it. So the younger Winchester is set to acquire two sets of simultaneous memories, neither of which are pleasant, and then has to deal with them. I'd say a seizure is the least of his worries at this point. I've feared how they could legitimately deal with this situation ever since Sam came back without a soul in the first place. Castiel has warned that Sam's soul currently feels like it was skinned alive. A return of memories, according to Cas, could mean Sam will be driven insane and locked away inside his own mind for the rest of his life. Is this a likelihood? Well, it would certainly be a great cliffhanger as we await a possible Season Seven. But, I feel that the show has to strike a delicate balance on this matter. They can't let Sam off too easily, else the build-up would have been for nothing. On the other hand, they can't damage Sam beyond repair because it wouldn't be the show if Dean's off fighting on his own while Sam's locked up in a mental hospital somewhere. How do you think they'll deal with the wall coming down? It's left to Kripke's hands at this point and I have the utmost faith that he'll give us a perfect balance of torture and triumph. Poor Sammy, that mental drywall wasn't going to last forever.